Ace trigger shoes. Willing to sell all or work out a trade for a few I need. 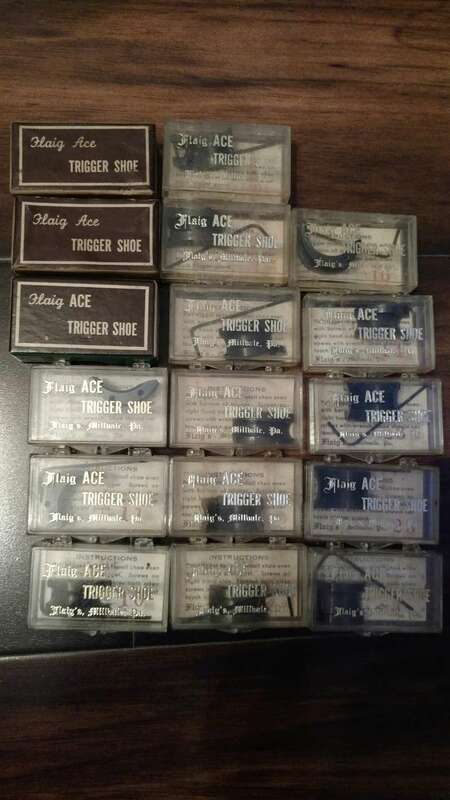 I need an Ace #15, I would like a Froneck shoe for a 3 hole 1911 trigger and two Froneck shoes for MKIIs (if there are any around?). They are all new, never used but some may have very slight discoloration that could probably be cleaned up. I would like to sell as a lot for 15 each. Will also trade toward 1911 Fung grips. I didn't mention that I'd trade three Ace shoes for one Froneck shoe. Ace shoes are great but Froneck makes the best shoe a trigger finger has ever touched (in my opinion). Do you have an R20 for 1911 super and Colt 35 Automatic? rich.tullo wrote: Do you have an R20 for 1911 super and Colt 35 Automatic? I've had several inquiries about selling individually and if I don't get an offer for all very soon I'll sell each separately. It would simply be much easier to sell/trade as a lot! Any trade offer will be considered but I'll add Herrett grips for 1911 or Ruger MKII as something I'm interested in. Ruger MKII parts are also something I'm always looking for but trade offers don't have to be something that I listed, I'll consider any trade offer! SteveBrown wrote: I've had several inquiries about selling individually and if I don't get an offer for all very soon I'll sell each separately. It would simply be much easier to sell/trade as a lot! Do you have any that fit a Springfield Armory trigger? I have a C3 that will fit. rich.tullo wrote: I have a C3 that will fit. Just to clarify I did mean a trigger that Springfield puts on their Range Officer or other similar triggers. Not their Mil Spec trigger. If you do in fact have one then would you consider selling just the one or if you have two I'd be interested buying two. Yes it will work with 3 hole triggers, I have one left.